Tis the Season for Spring Preparedness! With this week being Tsunami Preparedness Week (March 25-31) and April 18th marking the 106th anniversary the San Francisco Earthquake and Fire, DEM considers spring to be a season of preparedness. We hope this spring you and yours will build upon your preparedness and resilience—whether by visiting 72hours.org to develop your emergency plan; downloading SF Heroes to your smart phone to test your preparedness know-how; registering for AlertSF, our text-based message system that delivers emergency information to cell phones and other text-enabled devices, as well as email accounts—there are many simple and often immediate ways to enhance your preparedness and resilience. We also highly encourage you to become a trained member of San Francisco’s Neighborhood Emergency Response Teams (NERT). There also are numerous special events and initiatives taking place this spring to promote San Francisco’s preparedness and resilience. Here’s a snap shot of some of these great events and we hope to ‘see’ you there! 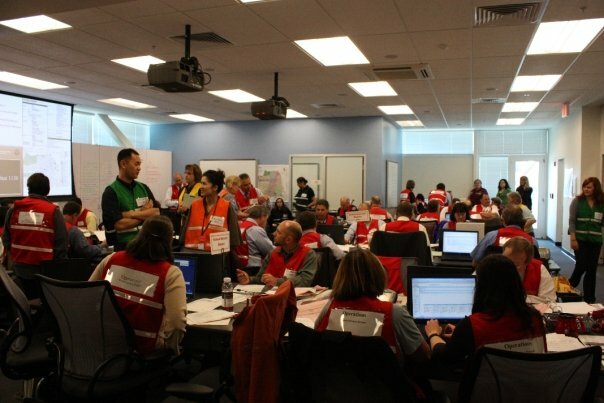 April 14, 2012 at Everette Middle School located at 450 Church St. from 8:30 a.m. – 1:30 p.m.
San Francisco Neighborhood Emergency Response Team (NERT) members from all over the city will meet to put their training into action in this three-hour drill. At the drill, NERT volunteers practice search and rescue techniques, triaging injured victims, setting up staging areas, and other essential disaster response skills. 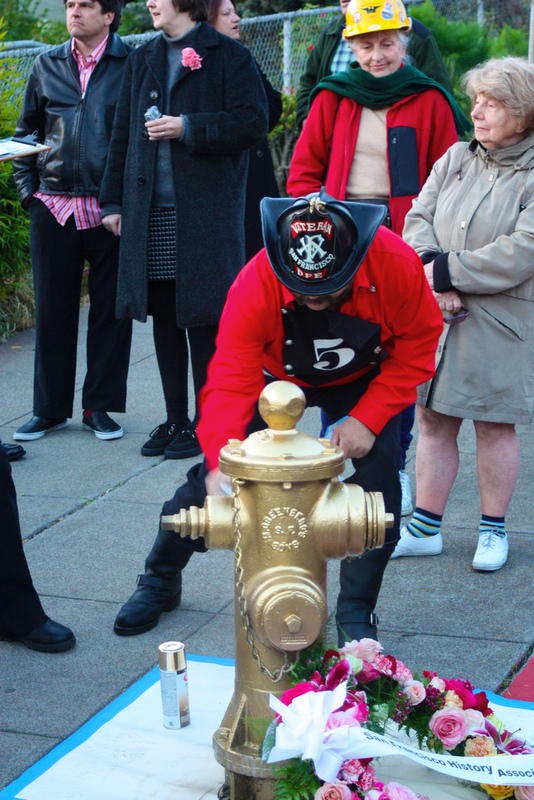 The drill commemorates the 1906 Great San Francisco Earthquake and Fire. NERT has held annual citywide drills since 1992; approximately 300 volunteers participate in the April Drill each year. Since the 1989 Loma Prieta earthquake, NERT has trained over 22,000 citizens to assist the San Francisco Fire Department after a severe earthquake or other major emergency by taking care of themselves, their families, and their neighbors. 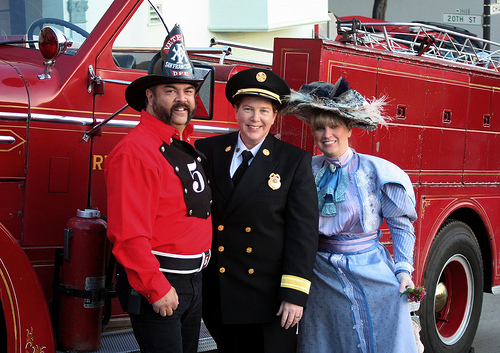 April 14, 2012 at the Salvation Army, Chinatown located at 1450 Powell St.
DEM dressed for the occasion to commemorate the 1906 Earthquake and Fire anniversary with San Francisco Fire Chief Hayes-White (center). On the anniversary of the Great Earthquake and Fire, San Franciscans gather around Lotta’s Fountain at 5:13 am to mark the exact time of the quake. The exhibition focuses on what steps can be taken now to ensure that homes are safe to occupy after an earthquake strikes. And what it will take to make sure our housing is Safe Enough to Stay. 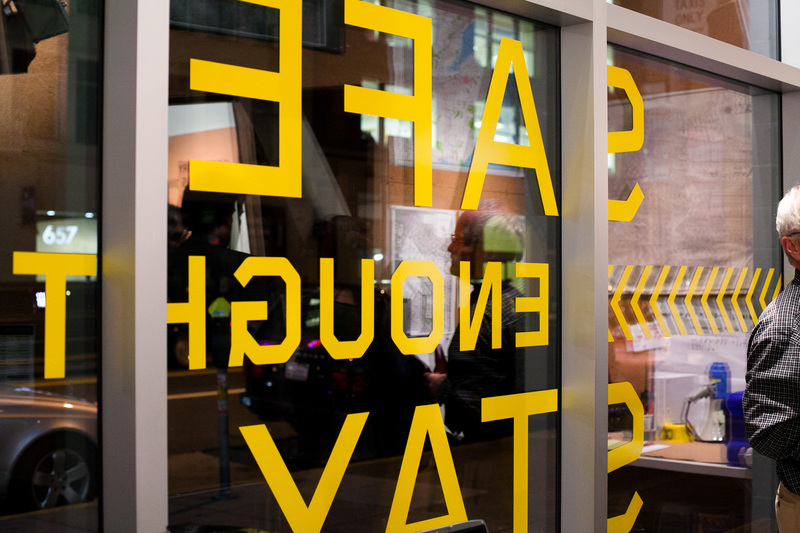 During this exhibition, the SPUR Urban Center gallery will be transformed to a post-earthquake state. See what damages an earthquake might cause and discover what materials you would need to survive as you shelter in place in a San Francisco studio apartment. The exhibition will also feature a simulation of a neighborhood emergency center, which would provide essential services and information for residents who remain in their homes. Learn about SPUR’s recommendations to help San Francisco achieve shelter in place standards and become a truly resilient city. For more information please visit SPUR Safe Enough to Stay. In an effort to promote awareness of what household items should be on hand during an emergency, DEM has developed a “Who Are You Shopping For?” campaign targeting the general public. The campaign entails providing signage to Walgreens, Safeway, Cole Hardware and a variety of other grocery stores along with post card handouts detailing an emergency supplies shopping list and “At a Glance” events. Today marks the one year anniversary of the Tohoku, Japan Earthquake and Tsunami. The earthquake was a magnitude 9.0 and was the most powerful known earthquake ever to have hit Japan, and one of the five most powerful earthquakes in the world since modern record-keeping began in 1900. The earthquake triggered powerful tsunami waves that reached heights of up to 133 feet and traveled up to six miles inland. The earthquake shifted the Earth on its axis by estimates of between four and 10 inches. Referred to as Japan’s 3/11 disasters, the earthquake and tsunami killed almost 20,000 people and caused a significant nuclear radiation leak. Immediately after the earthquake, the National Oceanic and Atmospheric Administration’s (NOAA) Pacific Tsunami Warning Center and the West Coast and Alaska Tsunami Warning Center both issued tsunami warnings for Hawaii, the U.S. West Coast, Alaska and the island territories in the Pacific. A tsunami warning is the highest level of alert so DEM got to work, gathering in the early morning hours at our Emergency Operations Center and began issuing public alerts and warnings about the tsunami expected to hit the California coast line (visit the San Francisco tsunami inundation map to know which areas in San Francisco can be impacted by a tsunami). Working from pre-dawn until post-dusk, it was a very long day for DEM and our fellow city departments and agencies that played a role in the response. Thankfully, the tsunami caused little damage. We were lucky. The activated DEM Emergency Operations Center. While the tsunami generated by the Tohoku Earthquake which hit Hawaii and the West Coast caused relatively minor damage, it reminds us of the need to be aware of how tsunami alerts and warnings are issued. There are various alerting tools available, including the City’s Outdoor Public Warning siren system; Emergency Alert System messages, which are broadcast on radio and television stations; and AlertSF, our text-based message system that delivers emergency information to cell phones and other text-enabled devices, as well as email accounts. If you live in San Francisco and have not yet registered for AlertSF, we urge you to sign up at www.alertsf.org. DEM also will use its social media channels to issue public alerts and warnings, so if you are on Facebook and Twitter, please ‘like’ and ‘follow’ us. The last week in March is Tsunami Preparedness Week (March 25-31, 2012) and this year’s theme is Nature’s Warning; meaning, a strong earthquake felt in a low-lying coastal area is a natural warning of possible, immediate danger, so keep calm and quickly move to higher ground away from the coast. And the 106th anniversary of the 1906 San Francisco Earthquake and Fire is April 18, 2012. We hope these events along with the first year anniversary of the Tohoku Earthquake and Tsunami are serious reminders to think about your earthquake and tsunami preparedness (visit 72hours.org to learn more about how to be prepared for emergencies) and inspire us to become better prepared and more resilient as a community. Drop, cover and hold on is the safest thing to do during an earthquake. A strong earhthquake felt in a low-lying coastal area is a natural warning of possible, immediate danger. Keep calm and quickly move to higher ground away from the coast. It is important to remain on high ground. 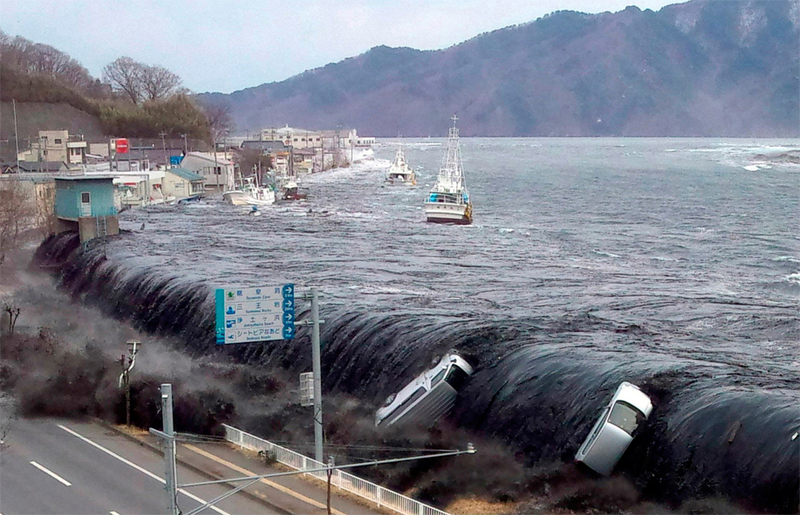 Waves from a tsunami may arrive eight hours or longer after the earthquake. We conclude this DEM Blog post with a moving video about the Tohoku, Japan Earthquake and Tsunami entitled: Arigato from Japan. Star marks the spot where recent seismic activity took place: the San Francisco Bay Area. Many of us in the San Francisco Bay Area were jolted awake yesterday morning by a pair of earthquakes within eight seconds of each other (the first a 3.5 magnitude earthquake and the second a 4.0 magnitude earthquake) along the Hayward Fault. Thankfully it was a minor shake along the precarious fault line, so most of us suffered little or no damage. But we all know that sooner or later there will be an earthquake that does more than interrupt an REM sleep cycle. The trick is to do what we can now…before the earth moves with more conviction than it did yesterday. Most of us know this, but even with this knowledge, do nothing. We suspect it is because there is a misconception that being prepared for an earthquake is analogous to building the Great Wall of China. The truth of the matter is we are more prepared than we think and once we believe this, taking our baseline of preparedness to the next level becomes a lot easier to accomplish. 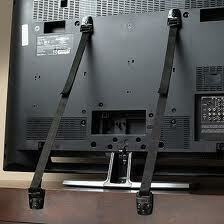 Anti-tip straps can save your TV from making a big mess during an earthquake. Although yesterday morning’s rattle woke many of us from slumber, we hope it will effect more than just going back to sleep. We at DEM urge you to use yesterday morning’s earthquakes as a call to action to build upon your preparedness foundation. And in doing so, enjoy the peace of mind that comes from helping you and your family be ready for an earthquake, or any emergency—big or small.